Normally when I read a historical fiction novel the book is set in Medieval England, but a few months ago I found a series set in England (Britannia back then) during the Roman occupation. I read the first two in a matter of weeks but was not sure I would read the third; the second seemed a little bit of a disappointment. As fate would have it, I won a copy of the third from the publisher and just finished it this morning. I would have finished it last night had my eyes not finally given out. 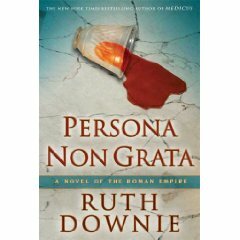 Persona Non Grata is Ruth Downie’s finest installment of her Gaius Petrius Ruso series to date. Ruso is a medic (before there were proper doctors and surgeons we had medics) working with the Roman military. Downie’s writing skills have sharpened since her first novel The Medicus. Here in Persona Non Grata we get fully fleshed out secondary characters, a great plot line and some really great scenes. My favorite scene involves Tilla leading a prayer at a secret Christos meeting. I almost laughed till I cried. We get to meet Ruso’s family including his ex-wife Claudia. The characters are all well written and often just as interesting as Ruso and Tilla. I came away understanding why Ruso would travel to the barbaric world of Britannia; with his family I would have too! This time the mystery hits very close to home and so it made perfect sense as to why Ruso would investigate it. I applaud Downie for having written evil characters that mirror some of our own Wall Street swindlers (though I admit I do not know of any wall street swindlers that have committed murder…yet). I get sick of bad guys who are so far gone that they do not seem in any way plausible. Many authors forget that even the bad guys have to connect with the reader on some level. Here though the characters are mere shadows and not fully fleshed out they are understandable. Greed turns many men bad. The only complaint I have with this series is the relationship between Ruso and Tilla his slave/girlfriend. I have written about this before but it bares repeating. The relationship just does not work for me. Downie does not work on the chemistry between the two. I know Ruso is really attracted to Tilla for her beauty but other than that I see no reason why these two are together. Fans of the series will be happy with the outcome of this book but it left me wondering why Downie did not spend a little more time developing chemistry between the two. Without giving too much away, I would have liked to have seen at least one sappy moment between the two or at least a scene in which Ruso finally figures out that he loves Tilla and tells her so. This would have made the ending all that much more satisfying and leaving this reader wanting more. I hope Downie continues to write as I look forward to watching her evolve as a writer. If you have not yet read this series you are missing out. I highly recommend it to everyone who likes historical fiction. If you have read this, I would love to hear from you, please keep in mind that others may share some spoilers so read the comments with caution.